Bass Champs tournament trail and television show. Haslet, Texas — Bass Champs announced today that Skeeter Boats will remain the title sponsor of the number one team tournament trail and television show. The leading trail has been partnered with the most trusted bass boat manufacturer in the world for the past 14 years. The agreement includes the Skeeter “Double Your Money” program at all regular season Bass Champs events as well as the Skeeter Owners Tournament where it pays to fish from a Skeeter! Since the first Skeeter boat was built in 1948, they have continued to progress into what is today the most innovative and trusted boat on the market. Skeeter released the Nationally Advertised price of the FX and ZX series in 2014 and has continued to offer a fully rigged, tournament ready bass boat at a price that can’t be found elsewhere. Skeeter Boats continues to offer a product that far surpasses their competition. Skeeter will continue to gain exposure through all facets of Bass Champs including their New Television Show featuring the top finishers of the 2015 season. Also, Skeeter will be represented through all tournaments and marketing outlets from Bass Champs. Skeeter will again offer the "Double Your Money" incentive for the highest eligible finishers at each regular season event winning up to $5,000! In addition, anglers with the first exact weight weighed in will have a shot to make $250 should they have a signed business card from a Skeeter dealer at the time of weigh in. At the year-end championship, October 8th & 9th, anglers will be fishing for over $200,000 in cash and prizes including a top award of a new Skeeter FX20 with Yamaha SHO 250, a second place award of a Skeeter ZX225 with Yamaha SHO 225 and 40 cash places. In addition to the 16 team events, Bass Champs will again host the annual Skeeter Owners event on Lake Fork scheduled for June 12-14th. This is the largest boat owner’s tournament in the world and had over 2000 anglers in 2015! “2015 was an incredible year for Bass Champs. We broke all kinds of records in attendance and payouts awarding over $2.5 million to weekend anglers. Now that we have plenty of water in the lakes and fishing is continuing to get better we look forward to continuing that trend. We are extremely blessed to have Skeeter as our title sponsor. Skeeter continues to build the best boats on the water and we are very proud to be part of the Skeeter family.” Chad Potts, President of Bass Champs. The Skeeter Bass Champs team tournament trail is shaping up to be yet again a record-breaking year. With recent rains all across Texas, the lakes are healthy and the fisheries are thriving. In 2016, Skeeter Bass Champs is offering a guaranteed 1st place of $20,000 cash at every regular season event along with the opportunity to make additional cash with the Skeeter “Double Your Money” incentive. For the 2nd year in a row, Bass Champs will be hosting the “Richest Guaranteed Open Team Tournament in the World,” the TX Shootout on Lake Sam Rayburn scheduled for June 26th. Anglers will be competing in a one-day tournament for a guaranteed first place prize of $50,000 Cash and a $10,000 bonus if the winner is in a qualified Skeeter Boat! In addition to team events, Bass Champs will continue to host Big Bass events such as the Sportsmans Auto Network MEGA BASS event on Lake Fork, March 20th. (formerly the Ford Mega Bass) This event is the World’s richest one day Big Bass event, and offers anglers a chance to WIN $20,000 CASH – EVERY HOUR plus a Skeeter boat for the heaviest bass of the day. This event had over 1900 entries in 2015. The final event of 2016 will be the 11th annual Berkley Big Bass event on Lake Fork (October 17th & 18th) This event boasts 20 places per hour and new Skeeter boats for the biggest bass over the slot and a new Skeeter boat for the biggest bass under the slot. This event had over 1000 entries in 2015. Skeeter Bass Champs is the leading team tournament trail in Texas rewarding anglers with the opportunity to fish for the largest cash prizes and maintaining the highest paying percentage of any team trail. For over 16 years, Bass Champs has been a mainstay for any tournament angler and provides the best and safest environment to compete. 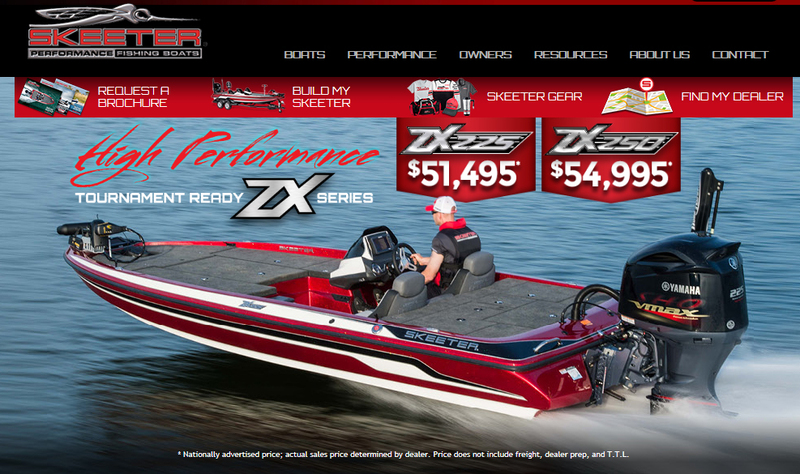 For more information about Skeeter Boats, visit SkeeterBoats.com. For More information on Bass Champs or to register for tournaments, visit BassChamps.com or call (817) 439-3274.